Loving Rice: Best. Ever. Meatballs. I've been taking a little bit of a break from meat-eating lately. While it's not my intention to become a vegetarian (yet or maybe ever...), I have been avoiding meat for awhile now. So, when my family raised the question "Can we please have a bit of meat?!" I realized that my cooking had gotten a tad bit extreme for my family's desires. Immediately, I thought... I'm going to make meatballs for dinner. Easy, meat eaters satisfied. So, I grabbed an old recipe and immediately recalled that they had a texture similar to my son's favorite red rubber bouncy ball. With my husband at work and my daughter at school, my three year old happily donned his chef's toque and climbed atop his kitchen step stool. "Meatballs?! Like in my book Cloudy with a chance of Meatballs?!" Sold. I had a day-long dedicated meatball making helper at my side. I opened the fridge and began pulling out bits and pieces of unusual ingredients thinking of ways to add moisture and sweetness to a really boring, basic recipe. The result? A fun morning with my son and the best meatballs in the world. Yes, I tasted them. Yes, my son was popping them so fast we had to make a second batch. Yes, I am going to create some sort of prize for myself and claim it. Yes, I will go head to head with anyone who thinks their long lost aunt's meatballs are better than mine. P.S. Later in the day, I told my husband that if there was one reason to go back to meat it would be this recipe. I look forward to consuming lots of them once my meat eating habit returns. One of my favorite features of this recipe is the size of the meatballs. Don't make them huge. Instead form them into small rounds about 3/4 the size of a golf ball. Heat 1 tablespoon of the veggie oil in a large skillet. Add the lemongrass. Add the carrots and cook until very soft, adding a few tablespoons of water as necessary to cook without burning. Add the green onions and cook just until wilted, approximately 2 minutes. Remove from heat and remove the lemongrass pieces. Add the green onions and carrots to a large mixing bowl. Set skillet aside for later use. Add beef, salt, pepper and 1/2 cup of the bread crumbs, raisins, milk and egg. Mix until well combined. Add additional bread crumbs (up to a 1/2 cup) as needed to allow the mixture to hold a ball shape. Begin forming small balls (about 3/4 the size of a golf ball) and set aside on a cookie sheet. Once all the balls are formed, place into fridge for 30 minutes. Then, heat remaining veggie oil in skillet, place meatballs into pan (working in batches) and cook until golden, turning frequently. Drain on kitchen towels and transfer to a lightly greased cookie sheet. Place into oven at 300 degrees F for 10 minutes. *just bash it with a meat pounder or the side of a knife so the fibers smash. Just saw your tweet and had to take a peek! I love so much about this: thinking of a 3yo in a toque, lemongrass and raisins in meatballs, and I'm LOL thinking of a vacation from vegetarianism to eat meatballs. TY for the laugh and a great recipe. Can't wait to try this. YUM. The lemon grass sounds good. After watching Food, Inc. I have become a very picky meat picker.... so yes, I am going to get all natural, organic, grass fed and have them for dinner this week. Gr8t picture too. My mouth is watering. Hi! I left you a note already, but wanted to tell you that I made these for tonight's dinner. They are the BEST MEATBALLS EVER! TY. These are going in my permanent recipe file. THESE ARE AWESOME. Why didn't I think of making meatballs sweet with raisins and carrots? Starting our third batch of these. My husband and I have taken these to work for the last two days in our lunches with a side of marinara for dipping. Delicious! I made these tonight for my family. We all loved them! I thought I needed extra bread to hold them together. But next time I think I'll stick to your measurements because I think they turned out just slightly dry. Thanks for another great recipe! Ken- I saw Food, Inc as well. I'm off of meat now and have embraced a vegetarian lifestyle. I still miss my steak but I feel better and sleep better knowing that I am doing my part in voting for healthier food. 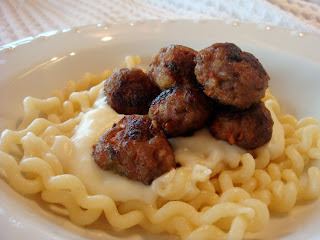 Loving Rice- Here is a challenge for you- create a recipe for the Best Ever Non-Meat Meatballs! Yes. I agree with Gary. Make us some veg meat balls. No one should be eating meat any more. The major meat manufacturers are poison.